If you have a look at the map here you will notice a portion highlighted in green. It is here that we find the greatest concentration of conflict in the world currently. One of the core reasons for this is that many countries and people in the region believe that Israel stole its land from the Palestinians. These countries are agitating and urging others to fight for the Palestinians to take back the land they consider to be rightfully theirs. When we sit here in our comfortable homes and consider the Old Testament, it can sometimes be hard to fathom how these old stories impact our lives today. The truth is much of today's wars and political conflicts find their root in one particular aspect of an ancient covenant where God is said to have promised one particular man one particular parcel of land - we have come to know that land today as Israel and the person that God covenanted with was Abraham. "There are multiple meanings to Malachi’s prophecy, one of which centers on temple work for our individual fathers, or ancestors, who await in the spirit world." In our first 6 weeks of Old Testament Study we have gone on a whirlwind tour of the first 1600-1700 years of the earth's existence from Adam down to Noah and the Tower of Babel (not including the periods of time taken during the 7 creation periods). Today we are fast forwarding again but only by a couple of hundred years or so from the events of the Tower of Babel. In contrast to the last six weeks speeding through time, we will now spend the next 4 weeks studying just one man - Abraham. Having studied Adam and Noah, and grown to appreciate the incredible contribution they made to man's existence, why do you think there is so much emphasis placed on the life of Abraham? On our way down through the 10 generations between Noah and Abraham we pass Noah's son Shem. From Shem comes the origination of the term "Semitic" (Shemites) which is now recognized as one of the titles of the Jewish people. There is also some evidence that Shem may have been the mighty high priest, Melchizedek, to whom Abraham paid tithes. Shem's great-grandson was called Eber (or "Heber"). According to Jewish tradition Eber refused to help build the Tower of Babel and was thus allowed by God to preserve their original pure language. This language, according to Jewish tradition was named after Eber (or Heber) and is what we call "Hebrew" today. Eber's son, Peleg is forever identified with the time when the earth was divided. It is unclear what kind of division. Many believe the earth and the original single land mass was physically "divided" into the continents we know today by the flood that occurred some decades (maybe a century) before Peleg was born while some believe that it happened after Peleg was born or maybe was an ongoing process in those decades in between and during the flood and Peleg's birth (Genesis 10:32). Others believe the earth was "divided" socially into tribes and nations and languages when the people were dispersed immediately after the Tower of Babel when Peleg was a young man (Genesis 10:5; 11:9). Others still believe that the earth was "divided" when the nations began fighting shortly after the Tower of Babel's events. Either way and in all ways, it seems Peleg was born into a period of great division and it is appropriate that his name in Hebrew has the definition of "division". Peleg's grandson Serug is credited with being one of the first in Shem's line to turn to idol worship. By now he had settled in the city of Ur, by the Euphrates river in lower Mesopotamia (believed by some to be modern-day Southern Iraq, and by others to be in Northern Syria/Southern Turkey). By the time we reach Serug's grandson, Terah, the family line is very strongly entrenched in idol worship and have distorted the teachings of the early patriarchs and prophets and are considered wicked. There are some ancient texts that suggest Terah was a high-ranking priest in this idol-worshipping sect and that he may even have had a business selling idols. Terah is reported to have had 3 sons. One of these sons he named Abram, later known as Abraham (Genesis 17:5; 1 Chronicles 1:27). Please recognize that even though we have traveled through a number of generations, when Abraham is born, Noah is still alive, Shem is still alive and all of the previously mentioned generations of Abraham were still alive. From the ancient texts we do have, they seem to have spread out across the lands and may not have been in close contact with each other, nevertheless they were all still living at the time of Abraham's birth. It is during this time however that the lifespan of the patriarchs seems to diminish greatly. Noah lived until he was 950 yrs old and Shem lived over 600 yrs but by the time Abraham was born (although Noah and Shem were both still alive) the more average lifespan appeared to be more around 170-200yrs. Abraham's story should serve as a great example and encouragement to all those in broken homes who suffer from abuse or depression or a lack of fulfillment and who seek happiness. The very first thing we learn of Abraham is that he had figured out his home was not a happy place and that he needed to get out of that harmful situation. Somehow he figured out there was more to life than the abuse and wickedness and corruptness he was raised in. What sets Abraham apart from his father here? Look for the verbs that describe Abraham's actions: 'finding', 'sought', 'desiring', 'desiring', and 'sought'. Do you get the impression that Abraham was idly wishing for these things? How bad do you think Abraham wanted this? What were the results of Abraham actively finding, seeking and desiring these things? "I became a rightful heir, a High Priest, holding the right belonging to the fathers"
What else did Abraham seek for in verse 4? "I sought for mine appointment unto the Priesthood according to the appointment of God unto the fathers concerning the seed"
Abraham directly sought out this promise and blessing and covenant, the same covenant that had been promised to Adam and to Noah. He knew of it and sought to obtain it for himself. Abraham 1:1; 2:1-6 physical departure from wicked traditions, departure from physical death (his brother Haran) - symbolizing possible departure from spiritual death also? Interesting to see he took his father with him, or his father followed after him. Does this suggest his father repented and followed Abraham spiritually also? The fact that his father "turned again unto his idolatry" (see v.5) suggests this was indeed the case. Note also his father was likely humbled by the Lord with the famine and the death of his son (v.1) but then returned to his wicked ways once his comfort levels returned. How often do we remember our God in times of trials only to give him up in pursuit of other things once we are over the trials and times are good again? Eg. do we become more consistent and sincere in prayer and fasting when times are tough only to return to less consistent and less heartfelt ways afterwards? Obviously, Abraham had not moved far away enough from the traditions of his fathers. In fact they followed him. Thus the Lord commanded Abraham to move further away. What kind of bad traditions/bad habits follow us in our life? Do we do enough to remove ourselves from those things or to leave those things behind in our lives? The overwhelming message from God and Abraham when faced with wickedness, abuse and corruption is "get out, get out, get out!" It is important to remember that any promise of blessing from the Lord carries with it an instruction of responsibility. 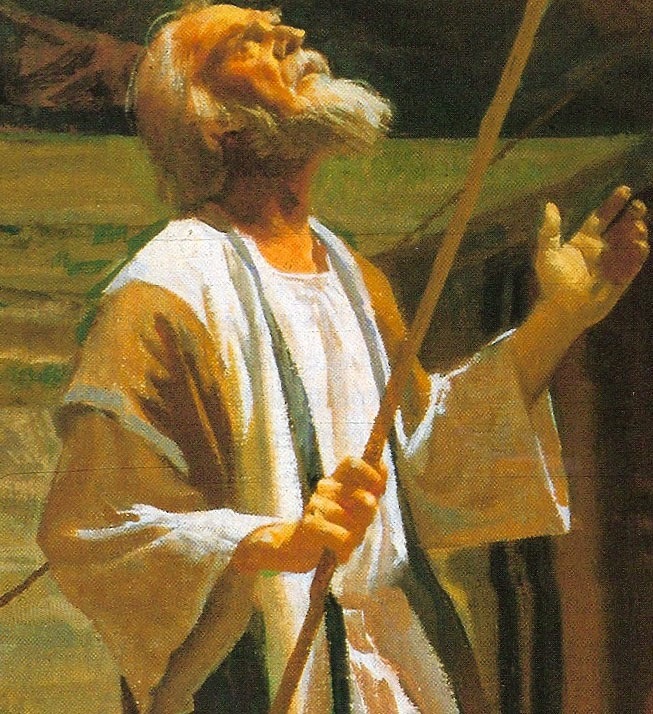 As the Lord blesses Abraham, he is also binding him to certain responsibilities. And so it is with us and the everlasting covenant, patriarchal blessings and so forth. Likewise, as we carry out certain responsibilities we bind the Lord to deliver certain blessings (cf Doctrine and Covenants 82:10). As we study Abraham's covenant with the Lord, consider using this same method to review your own personal patriarchal blessing. In highlighting the relevance of certain responsibilities with specific blessings, I am sure you will find a new level of clarity in understanding and appreciation of this personal blessing to you from the Lord. "ever-willing to answer the consistent prayer of the humble". And indeed in verse 6 of Abraham 2 we see the Lord answers Abraham's prayer and proceeds to instruct him and bless him. Abraham 2:6; Genesis 12:1"a strange land which I will give unto thy seed after thee for an everlasting possession". Consider how much bloodshed has centred around this parcel of land. Why did the Lord apportion this land to Abraham and his children/descendants/heirs? What is so special about it? Why did others lose the right to the land or why could they not share it? Abraham 2:9; Genesis 12:2 "I will make of thee a great nation"
Abraham 2:9; Genesis 12:2 "Bless thee above measure"
Abraham 2:9; Genesis 12:2 "Thou shalt be a blessing unto thy seed after thee"
Abraham 2:9 Thy seed "shall bear this ministry and Priesthood"
Abraham 2:10 those who receive the gospel "shall be called after thy name, shall be accounted thy seed, shall rise up and bless thee as their father." Abraham 2:11; Genesis 12 :3 Lord will "bless them that bless" and "curse them that curse" Abraham. Abraham 2:11; Genesis 12:3 "in thy seed...shall all the families of the earth be blessed with the blessings of the Gospel" (salvation and eternal life). Abraham 2:6 Thy seed must "hearken unto my voice"
Abraham 2:9 Thy seed must "bear this ministry and Priesthood unto all nations"
Now I'm no contractual expert but it seems pretty clear that this is a very one-sided contract. Compare the number of instructions to the number of blessings Abraham received. It reminds me of the great talk King Benjamin gave at the General Conference of c.124 BC (cf Mosiah 2:19-24). The Lord seeks to bless us immeasurably at every possible opportunity. Now consider the questions we asked earlier regarding why Abraham had been promised the specific parcel of land and why he could not share it with just anyone. But this time consider them within the context of the land being a symbol of the celestial kingdom. Why is the celestial kingdom saved for only a chosen few who are called children of Christ? What is so special about the promised land of the celestial kingdom? How do others lose their right to it? There are two ways to view this repetition of the covenant. Either this was the first formal application of the covenant or this was a renewal of the covenant. Potentially the promise of blessings in Genesis 12 and Abraham 2 was just that - a promise of being able to partake of the covenant in the future, much like we promise new members that they can partake of sacred covenants in the temple when they are ready. In that initial invitation Abraham is instructed to leave unholy places, essentially as preparation to receive this covenant. Alternatively, Abraham partook of the covenant initially and is now renewing this covenant. The fact that the Lord gives Abraham a new token of the covenant suggest it may well have been a renewal and a reminder of the covenant already made. And that raises the question why? Why did the Lord feel the need to renew this covenant with Abraham 24 years later? What other covenants does the Lord have us renew and why? But whether it be freshly undertaken or renewed, it is clear the Lord made great promises to Abraham as he did to Adam and to Noah and other of the great patriarchs, before and after Abraham. Genesis 17:1 "walk before me"
Genesis 17:1 "be thou perfect"
Genesis 17:4 "thou shalt be a father of many nations"
Genesis 17:6 "I will make thee exceeding fruitful"
Genesis 17:6 "I will make nations of thee"
Genesis 17:6 "Kings shall come out of thee"
Name change: The tradition of changing a name to signify or authenticate a covenant or promise is an ancient one that still exists day. Consider the marriage covenant today where a young woman signifies or authenticates that she is indeed in covenant with her husband by taking upon her the name of her husband. The scriptures are full of this marriage symbolism between the Lord and his people. He considers us his chosen people and in entering the covenant we take upon us his name. "While many suggest that Abram means "exalted father" and Abraham means "father of a multitude", both names in fact mean exactly the same thing "father lifted up" or "exalted father". The beginning of both names is אב (AB) meaning "father". The "ram" in Abram is דם meaning "lifted", a parent root. The "raham" in Abraham is רהם also means "lifted"...It does not make much sense to change a name if the new name means the same thing. This is why many attempt to make a change in meaning. But, to understand the real meaning behind a name change is important for understanding why God changed his name and the names of others such as Jacob to Israel. Another alternative is to take the root form "Ab" meaning "father" and then "raham" that can be interpreted as mercy and compassion (see Hosea 1:6). Compassion is not quite strong enough for the literal meaning. Phrases such as tender mercy and deep compassion and unbreakable bond would be more appropriate for a true understanding of the word. Within that context, imagine what the Lord is saying to Abraham as he gives him this name and covenant. I don't think we need to get caught up too much further in what his name actually did or didn't mean. Suffice it to say this was a highly personal and meaningful moment between the Lord and Abraham and both undertook the covenant in love, intent on honouring it. This process of receiving a new name and new tokens will be familiar to all faithful saints who undertake the new and everlasting covenant within the holy temple. Genesis 17:7 "And I will establish my covenant between me and thee and thy seed after thee in their generations..."
These two attitudes are best illustrated by the children of Israel, throughout the Old Testament, who desired too often to become like the world and by the Pharisees, in the New Testament, who overcompensated for the children of Israel's desire by becoming too aloof with the world. We need to find a balance in the middle where we are in the world but not of it. Read Abraham 2:15-16 I love these verses. It gives us another little insight into the kind of man Abraham was. He honored his covenant including his missionary work! He won souls and they followed him to the promised land. To be worthy of the great blessings of the Abrahamic covenant we too must share the gospel with others. In living this way, we too may be able to one day say "eternity was our covering and our rock and our salvation".